Roman general and governor of Judea in 117 C.E. Originally a Moorish prince, his military ability won him the favor of Trajan, who even designated him as his successor. During the emperor's Parthian campaign the numerous Jewish inhabitants of Babylonia revolted, and were relentlessly suppressed by Quietus, who was rewarded by being appointed governor of Judea (Eusebius, "Hist. Eccl." iv. 2; idem, "Chronicon"; Orosius, vii. 12; Dio Cassius, lxviii. 32). The restlessness in Palestine caused Trajan to send his favorite, as a legate of consular rank, to Judea, where he continued his sanguinary course. Rabbinical tradition (Soṭah ix. 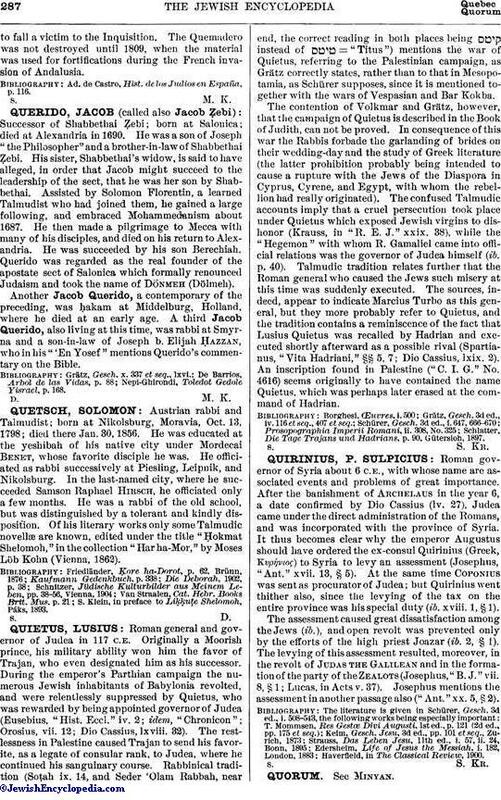 14, and Seder 'Olam Rabbah, near end, the correct reading in both places being instead of = "Titus") mentions the war of Quietus, referring to the Palestinian campaign, as Grätz correctly states, rather than to that in Mesopotamia, as Schürer supposes, since it is mentioned together with the wars of Vespasian and Bar Kokba. The contention of Volkmar and Grätz, however, that the campaign of Quietus is described in the Book of Judith, can not be proved. In consequence of this war the Rabbis forbade the garlanding of brides on their wedding-day and the study of Greek literature (the latter prohibition probably being intended to cause a rupture with the Jews of the Diaspora in Cyprus, Cyrene, and Egypt, with whom the rebellion had really originated). The confused Talmudic accounts imply that a cruel persecution took place under Quietus which exposed Jewish virgins to dishonor (Krauss, in "R. E. J." xxix. 38), while the "Hegemon" with whom R. Gamaliel came into official relations was the governor of Judea himself (ib. p. 40). Talmudic tradition relates further that the Roman general who caused the Jews such misery at this time was suddenly executed. The sources, indeed, appear to indicate Marcius Turbo as this general, but they more probably refer to Quietus, and the tradition contains a reminiscence of the fact that Lusius Quietus was recalled by Hadrian and executed shortly afterward as a possible rival (Spartianus, "Vita Hadriani," §§ 5, 7; Dio Cassius, lxix. 2). An inscription found in Palestine ("C. I. G." No. 4616) seems originally to have contained the name Quietus, which was perhaps later erased at the command of Hadrian. Schlatter, Die Tage Trajans und Hadrians, p. 90, Gütersioh, 1897.